January 23, 2017 – This week, our time machine turns on the four-wheel drive, as we hike into Allegheny National Forest, hunting for history. Established in 1923, the forest covers over half a million acres of the northwestern Pennsylvania foothills, and offers us the chance to experience the same sights, sounds and wildlife, as our forebears stretching back to the dawn of civilization. 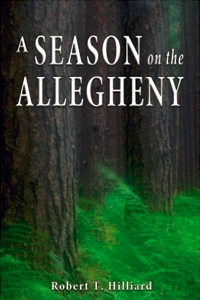 Joining us with his walking stick is author Robert Hilliard, author of, A Season on the Allegheny . Rob has written on sports, history, and the outdoors for over two decades. He’s formerly a contributing editor with Ohio Valley Outdoors magazine, and contributed to the history anthology, Rivers of Destiny. You can pick up his trail by following him on Twitter @RobHilliard_66, or toss him a like at Facebook.com/ASeasonOnTheAllegheny. You can also read his piece on The Pennsylvania Tuxedo, by Woolrich, “The Original Outdoor Clothing Company.” You can also check out the history behind Johnny Cash’s song, “As Long as the Grass Shall Go,” off his Bitter Tears Album, and how President John F. Kennedy broke a treaty with the Seneca, which dated back to George Washington, to build the Kinzua Dam.